The Board remains mindful of the need to maintain an appropriate balance between the governance expectations of investors, regulators, government and other stakeholders, and the market demands that the Group delivers competitive financial returns to its shareholders. Governance in the Group extends beyond mere legislative and regulatory compliance. Management strives to entrench an enterprise-wide culture of good governance aimed at ensuring that decisions are taken in a fair and transparent manner, within an ethical framework that promotes the responsible consideration of all stakeholders, while also holding decision-makers appropriately accountable. In line with the philosophy that good corporate governance is an evolving discipline, governance structures, practices and processes are actively monitored and revised from time to time to reflect best practice. The Board is accountable to shareholders and other stakeholders and is ultimately responsible for the implementation of sound corporate governance practices throughout the Group. Aspen's Board of Directors is committed to ensuring that the Group adheres to high standards of corporate governance in the conduct of its business. The directors are of the opinion that the Group has applied the requirements of King IV. The application of the King IV principles and adoption of the various recommendations set out there is more fully detailed in our unabridged Corporate Governance report available online. made decisions on key issues or matters and delegated authority for the day-to-day running of the business of the Group to management in line with an approved Group approvals framework. The Board is currently led by Kuseni Dlamini, an independent non-executive director. The Board has appointed Roy Andersen as the lead independent non-executive director to act as Chairman in instances where the Chairman may be unavailable or have a conflict of interest. As with the chairmanship, the appointment of the lead independent non-executive director is made by the Board annually, after each annual general meeting. Both the Chairman and the lead independent non-executive director have formally mandated roles and responsibilities and the Chairman is subject to an annual evaluation of his performance. The evaluation of the Chairman's performance is coordinated under the direction of the lead independent non-executive director. The roles of the Chairman of the Board and the Group Chief Executive are separate and clearly defined, such that no one individual director has unfettered powers of decision-making. 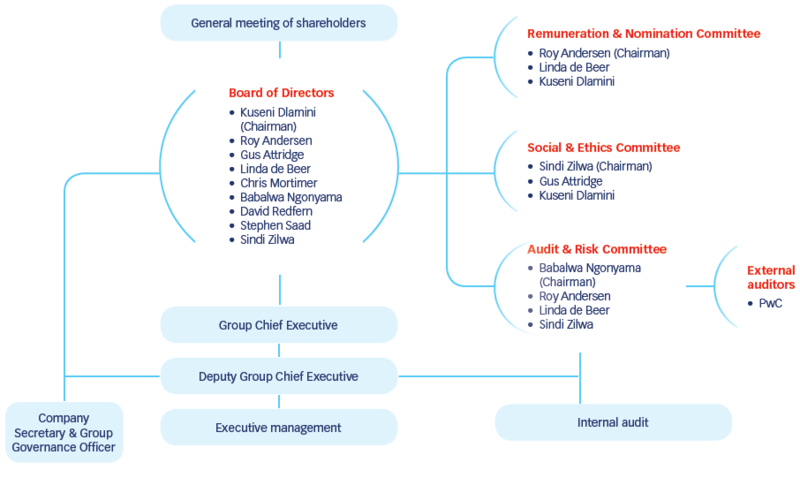 The Board currently comprises nine directors, two of whom are executive directors with the remainder being non-executives. Five of these are considered independent non-executive directors and constitute the majority of the non-executive directors on the Board. The composition of the Board is carefully considered to ensure that there is an appropriate balance of power and authority in decision-making processes. Non executive directors are appointed by the Board in terms of a formally documented and transparent process which takes place under the guidance of the R&N Co.
Non-executive directors are selected on the basis of their skills, business experience, reputation and qualifications. Gender and racial diversity is also considered in the appointment of new directors. While non-executive director appointments are based on merit and overall suitability for the role, the R&N Co remains appreciative of Aspen's status as a multinational pharmaceutical company and diversity considerations when making recommendations for appointment to the Board. The Board further recognises that, as a South African-based company, it is important to consider the gender and racial diversity of the Board and as such has adopted a policy and set aspirational targets of 50% female representation (currently at 33,3% – 2017: 30) and 50% black representation (currently at 33,3% – 2017: 40%) in the number of directors who serve on the Board. These targets will be reviewed from time to time to ensure broader representation into the future. The Deputy Group Chief Executive fulfils the role of full-time executive financial director and the appropriateness of the expertise and experience of this director is assessed and reported upon by the A&R Co on an annual basis. The appointment of any new director is considered by the Board as a whole on the recommendation of the R&N Co and in terms of a formally adopted policy, following rigorous and transparent appointment processes which include conducting the appropriate background confirmations. The terms and conditions of appointment of each of the non- executive directors are contained in a letter of appointment which, together with the Board Charter, forms the basis of the director's appointment. Newly appointed non-executive directors are required to provide details of their professional commitments outside of Aspen and a statement that confirms that he or she will have sufficient time available to fulfil the responsibilities ascribed to directors. The R&N Co, consisting exclusively of independent non-executive directors and chaired by the lead independent non-executive director, is responsible for making recommendations to the Board for the identification and removal of underperforming or unsuitable directors, should this prove necessary. While no formal staggered rotation arrangements are in place, the Company's memorandum of incorporation requires one-third of the non-executive directors to retire by rotation at each annual general meeting. Directors who retire may, if eligible, offer themselves for re-election. The re-election of retiring directors by shareholders is subject to a recommendation by the R&N Co, following an evaluation of those directors' performance. Directors who may be appointed during a reporting period must have their appointments ratified at the next annual general meeting. No new directors were appointed during the year. Although non-executive directors have no fixed terms of appointment, the Board Charter provides for the automatic retirement of a director at the age of 70. At the Board's discretion, the retiring director may thereafter be invited to serve as a non-executive director on a year-to-year basis, provided that shareholders confirm such reappointment at the next annual general meeting. At the Board's discretion, the retiring director may thereafter be invited to serve as a non-executive director on a year-to-year basis. Roy Andersen, who has turned 70 during the year, has been invited by the Board to serve as a director for the year and this reappointment has been proposed to shareholders in terms of ordinary resolution 3 as set out in the notice of the 2018 annual general meeting. The average overall attendance rate of the Board meetings for the 2018 financial year was 43%. All of the Board Committees are constituted in accordance with the recommendations of King IV and are chaired by an independent non-executive director. The Terms of Reference of each Board Committee are reviewed as necessary and specify the relevant Committee's constitution, mandate, relationship and accountability to the Board. Detailed reports on the constitution, role and performance of each Board Committee are available online. The A&R Co consists exclusively of independent non-executive directors. The members of this Committee are elected by shareholders at every annual general meeting. * Maureen Manyama did not make herself available for re-election at the Company's AGM held on 7 December 2017. The average overall attendance rate of the Board meetings for the 2018 financial year was 96,4%. The Board meets at least once every quarter. These meetings and the meetings of the Board Committees are held as scheduled, with additional meetings being convened to discuss specific issues which arise between scheduled meetings. Board meetings are convened by formal notice to the directors. There are comprehensive management reporting disciplines in place with strategic, financial, operational, risk and governance reports tabled. Meeting packs, containing detailed proposals and management reports, are distributed by the Company Secretary & Group Governance Officer to all directors in a timely manner in advance of scheduled meetings, and directors are afforded ample opportunity to study the material presented and to request additional information from management where necessary. Decisions taken at Board meetings are decided by a majority of votes, with each director having one vote. Where resolutions need to be taken between Board meetings, a written proposal is circulated to all directors, and requires approval by a majority of directors to be valid. The Board Committees report formally to the Board at each Board meeting following any meeting of a committee. An evaluation of the performance of the Board, the Board Committees, the Chairman, the Group Chief Executive, the Company Secretary & Group Governance Officer and of each of the individual directors is conducted annually under the stewardship of the R&N Co. Evaluations are designed to gain an insight into how each of the directors of the Board believes the Board is meeting its objectives. While the results of these assessments were found to be satisfactory, the Chairman has engaged with directors in respect of certain aspects raised as a result of the evaluation process. The independence of the non-executive directors is tested on a regular basis to ensure that there are no business or other relationships which could materially interfere with a director's capacity to act independently. At least once annually, we actively solicit details of our directors' interests in the Group, their material external shareholdings in companies they are directors of and other directorships so as to determine whether there are any actual or potential conflicts of interest. Directors are expected to consider whether any shareholding in the Company affects their independence and discuss the matter, if appropriate, with the Chairman. A register containing the directors' declarations of interest is kept by the Company Secretary & Group Governance Officer, circulated to all directors at least once per year and is available for inspection by any of the directors on request. In addition, the agenda at each scheduled Board meeting allows the Board to consider any conflicts arising from changes to the directors' declarations of interests. The Board has satisfied itself that no relationships exist which could adversely affect the classification of its independent non-executive directors and accordingly that the classification of each of the directors is appropriate. The independence of non-executive directors who have served on the Board for longer than nine years is assessed annually. The Board has delegated succession planning for the Group Chief Executive, Deputy Group Chief Executive and senior executives to the R&N Co with direct input, as appropriate, from the Chairman and the Group Chief Executive. Succession plans are integrated into the key performance areas ("KPAs") at management and executive levels and reported to the Board annually. Directors conduct themselves in accordance with our Code of Conduct and act consistently in performing their common law and legislative duties of care, skill and diligence, giving due consideration to their fiduciary responsibilities towards the Company. The Company Secretary & Group Governance Officer plays a pivotal role in the corporate governance of the Group. He is appointed by and is accountable to the Board as a whole. He attends all Board and Committee meetings and provides the Board and directors, collectively and individually, with guidance on the execution of their governance role. The Board has considered and is satisfied with the qualification, competence and expertise of the Company Secretary & Group Governance Officer. He is not a director of the Company and the Board has also satisfied itself of the fact that he continues to maintain an appropriate arm's length relationship with the Board. All directors have access to the advice and services of the Company Secretary & Group Governance Officer. Newly appointed directors are required to participate in an induction programme coordinated by the Chairman together with the Company Secretary & Group Governance Officer. In addition to providing an orientation in respect of the Group's operations, directors are guided in their fiduciary duties, provided with information relating to the relevant statutory and regulatory frameworks and introduced to key members of management. The programme makes directors aware of relevant policies such as those relating to dealing in the Company's securities, the duty to declare conflicts of interest and our Code of Conduct. The Company Secretary & Group Governance Officer is also, with the assistance of the Group Legal Officer & Group Compliance Officer, responsible for ensuring that directors are kept abreast of relevant legislative and regulatory developments as well as significant information impacting the Group's operating environment. Training sessions for non-executive directors are held regularly and are presented by senior management or subject experts. These sessions are designed to keep directors updated on developments in the Group and the territories in which it operates as well as other relevant matters. While the Board is ultimately responsible for overseeing the Group's compliance with laws, rules, codes and standards, it has delegated to management the responsibility for the implementation of an effective legislative compliance framework and processes. The Board has considered the compliance framework that has been established by management and has satisfied itself that it is adequate. Our Group Legal Officer & Group Compliance Officer fulfils the function of Group Compliance Officer in providing the Board with assurance that the Group is compliant with applicable laws and regulations. The strength of the Group lies in its ability to foster and maintain strong relationships with its stakeholders through transparency and effective communication. The Board of Directors is committed to sustaining Aspen's established credibility and rapport among its stakeholders - this commitment is dealt with in more detail in its Stakeholder Engagement report available online. In line with this policy, conflict and dispute resolution is dealt with through constructive dialogue with the relevant parties. Where this preferred method does not result in adequate resolution of the matter, external legal advisers, mediators and/or arbitrators are engaged to expedite resolution. 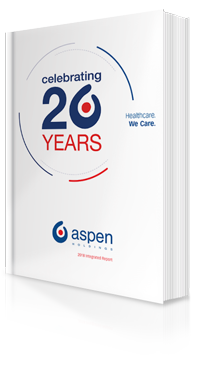 Aspen's vision to deliver value to its stakeholders as a responsible corporate citizen that provides high quality, affordable medicines and products globally is contained in its responsible corporate citizenship philosophy which is available online. Risk management is an embedded attribute of Aspen's corporate culture and is inherent in all its business decisions, activities and transactions. Risk management is considered to be a prerequisite to the sustainability of the Group. As such an integrated approach to risk management is implemented giving due consideration to economic, environmental and social indicators which impact the Company and its stakeholders. Both the opportunities and threats underlying each identified risk are considered to ensure a balanced outcome between risk and reward for the sustainability of the Group as a whole. Our risk management objectives aim to sustainably support the effective pursuit of the Group's strategy. Development of standards and templates with encouragement of re-use where appropriate. Internal audit is an independent, objective assurance and consulting activity aimed at assisting us to accomplish our objectives by bringing a systematic, disciplined approach to the evaluation and improvement of the effectiveness of risk management, internal control and governance processes. This function is supported by approved external assurance providers.